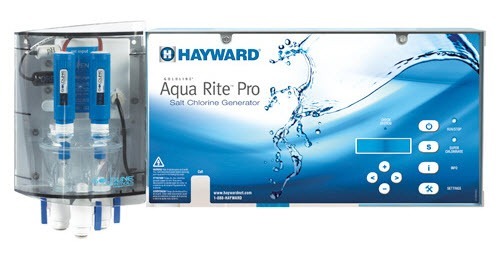 Upgrade your swimming pool pleasure & protect your family today with a CONNECT-A-DECK Pool Deck Kit! Safety: Like a mother bird in her nest you can sit high perched upon your deck and keep watch while your family is at play and have fast access to them if needed. Connect A Decks come complete with a fence, ladder and safety enclosure barrier with a self-closing, self-latching, lockable device so you can better protect entry to your pool. Pool Entry: Connect A Deck is the perfect upgrade in place of an A-frame ladder. It provides easier entrance and exit to and from your pool. 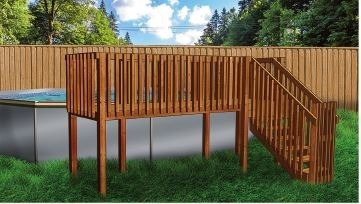 Connect A Decks come in 4 standard sizes: 4’x8′, 4’x16′, 8’x8′ & 8’x16′. 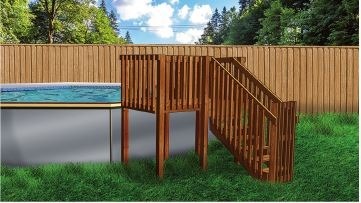 Versatility: Connect A Decks fit any height, shape, size or manufactures above ground pool. Each unit offers enough space to fit several people and a lounge chair. 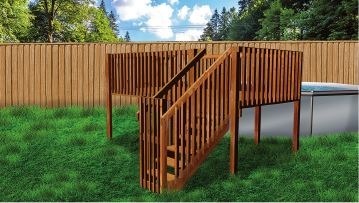 Inexpensive: Aluminum deck pools are very expensive and don’t come with an enclosure barrier. Connect A Decks are not expensive and come with a safety enclosed barrier. 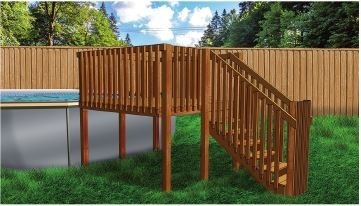 EZ to Assemble: A 4’x8′ Connect A Deck takes 2 men only 4 hours to assemble. It connects to your pool not your home. As such, it is considered a free standing temporary structure not a permanent structure. Connect A Decks do not require deep post holes to be dug out or cement footings to be poured, they rest firmly on patio blocks. Superior Quality: Connect A Decks are made of strong proven treated lumber. Just as a comparison a standard aluminum deck pool post uses 1-1/2″ hollow posts as compared to a Connect A Deck which uses 4″x4″ solid wood posts. Therefore Connect A Decks are far superior in overall strength. Will Outlast Pool: Connect A Decks are made of strong treated lumber similar to that of most house balconies and outdoors patio decks. Therefore they will outlast the pool they are attached to. Aesthetically Pleasing: Connect A Decks can be painted, stained or kept natural to match your pool, home or decorating desire.